This Sterilite mini clip box comes in a set of 6. Use Sterlite mini clip boxes to organize little items that tend to get cluttered in junk drawers. 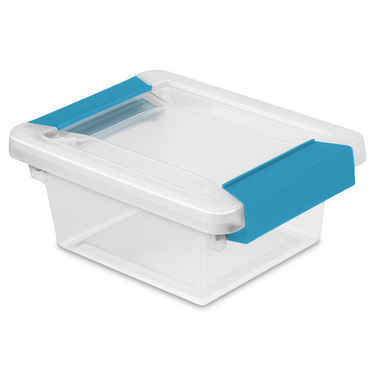 These Sterilite mini clip boxes are the small plastic storage containers that are useful in many rooms of your home or office. They can hold batteries, magnets, pens and pencils, and so much more. In the bathroom, you can use a Sterilite mini clip box to hold all of your small toiletries or organize your medicine cabinet. In the office, you can store notebooks, push pins and paper clips in a Sterilite mini clip box and tuck it safely away in a desk drawer. Like all Sterilite clip boxes, these have a lid with colored clips to keep all of your little items secure. These mini clip boxes also make it easy to find what you need with a clear exterior. The Sterilite mini clip boxes can be stacked on top of one another, making them space efficient. There are endless possibilities for using these mini clip boxes. Comes in a set of 6 Sterilite mini clip boxes.